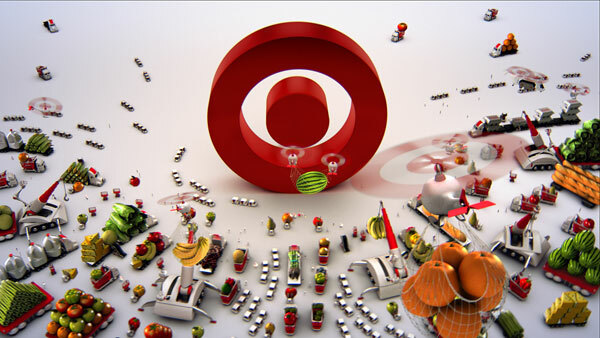 Target approached Motion Theory with the goal of creating a dynamic, engaging animated world that embodied teamwork and captured audiences with the personality and style of a feature-length animated feature – all the while echoing the friendly, stylish surprises of the Target brand. 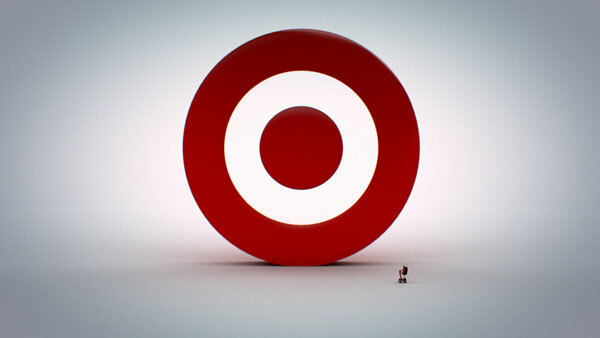 The piece opens with a monumental Target bullseye (the brand logo) opening at the touch of a button – casting a shadow across the landscape and introducing a crew of quirky little workers standing alongside their machines, staring in awe as they see what’s inside the bullseye for the first time. 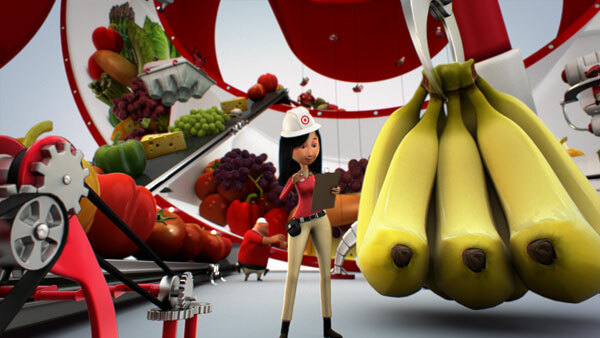 The crew of characters immediately start carting in different fruits and vegetables via all sorts of familiar-looking items built into extraordinary machines. The tempo of the story bursts into activity as the camera glides through the action, highlighting remarkable clockwork efficiency within what would otherwise appear to be absolute chaos. The team spirit and personality is explored in cinematic fashion, moving from vertigo inducing high angles and sweeping helicopter shots that look down at the ant-sized workers below, to ground-level angles that show off the great towering mass. 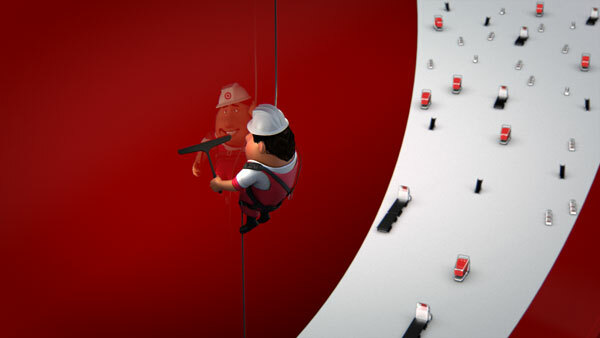 Whether they are riding zippy motorized three-wheeled vehicles, using combination wheelbarrow-catapults or bike-powered conveyor belts, or even scaling the bullseye on Mission Impossible-style harnesses, the animated team members are only satisfied when every little nook and cranny in the bullseye is jam-packed with everything fresh. Nor is the exterior ignored either, as the spot ends with a loud squeak of a squeegee making the bullseye shine followed by the departure of the workers. Motion Theory Director Chris Riehl led the in-house team of animators and artists through a very condensed production schedule that mirrored the character and story development of a much larger CG animated film. The goal from the beginning was to create human and naturalistic characters with the depth to support a great variety of stories. 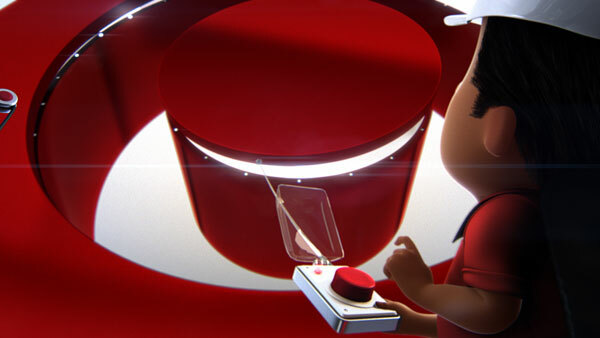 The characters were all developed as in-house originals at Motion Theory, which also created a range of Target-branded utilitarian uniforms and nifty gadgets.